WA's longest running amateur surfing event the Sunshine Surfmasters is celebrating its 40th year and this years event will be dedicated to the memory of WA surfing icon Ian ‘Sam’ Salmond who sadly passed away in February 2016. The event will again highlight the efforts of the Geraldton Boardriders Club when it comes to hosting events in the Mid-West. This one off specialty event brings together the who's who in WA surfing in one of the best event settings possible; warm weather, pumping surf and good times is what the Sunny Comp is all about. The Sunny Comp has Open and Age divisions on offer form surfers of all ages and abilities, plus the Expression session. The non-competitors division is for surfers who have not competed in a surfing event during 2016. Divisions include: Open Men, Open Women, Cadets (16 & Under), Juniors (19 & Under), Seniors (30 & Over), Masters (40 & Over), Grand Masters (50 & Over), Sam’s Division (60& over) and Non-Competitors. With an anticipated Cash and Prize pool over $12,000 this is must attend event. Entries are $65 and close 5pm Wednesday 31st August 2016. 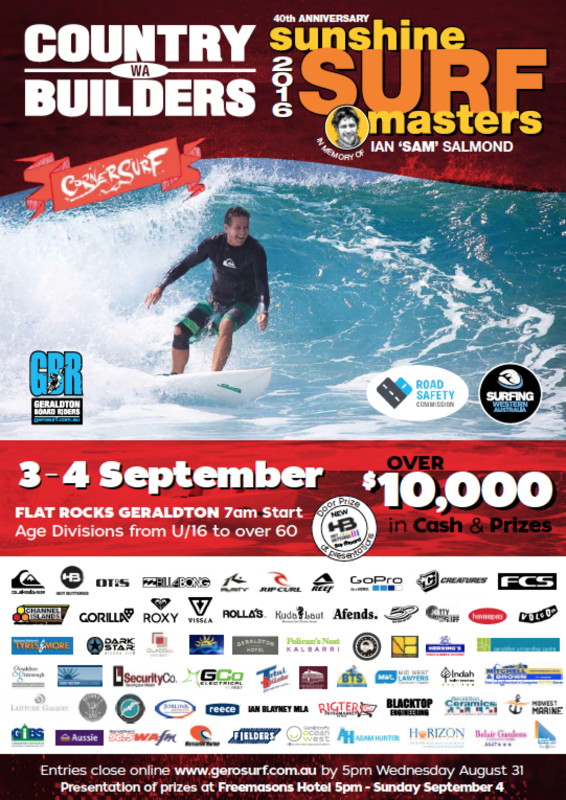 Be sure to check out www.gerosurf.com.au and the GBR Facebook Page for all the event updates. All ages taken as of the 1st September 2016. Multiple division entry is allowed for this event and is limited to 2 eligible divisions. Divisions include: Open Men, Open Women, Cadets (16 & Under), Juniors (19 & Under), Seniors (30 & Over), Masters (40 & Over), Grand Masters (50 & Over), Sam’s Division (60& over) and Non-Competitors (Mustn’t have competed in 2016). Entries will be $65 and close 5pm Thursday 1st September 2016.